This article is about the battle course from Mario Kart: Double Dash!!. For the actual game console, see Nintendo GameCube. The Nintendo GameCube battle course is a battle course in Mario Kart: Double Dash!!. The course consists of a giant Nintendo GameCube floating in what appears to be outer space, and is the simplest course in the game, for it is just a plain surface with glass walls surrounding it with the Nintendo logo; the course is entirely flat except for the small depression in the center of the disc cover opening button. The Nintendo GameCube is purple with a picture of Mario and Luigi in the Red Fire in the center along with the Mario Kart logo. 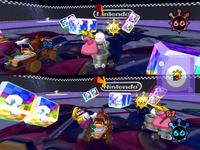 Mario Kart DS features another battle course that takes place on the game's console. This page was last edited on January 22, 2019, at 08:37.